Background The aetiology and origin of gastrointestinal symptoms in Parkinson's disease (PD) remains poorly understood. Gastroparesis, small bowel transit delay and bacterial overgrowth may, individually or collectively, play a role. Aims In patients with PD and functional gastrointestinal symptoms, we aimed to determine the utility of the wireless motility capsule and lactulose breath tests in further defining their symptoms' aetiology. Methods In this retrospective cohort study, consecutive patients with PD and functional gastrointestinal symptoms underwent clinical assessment, as well as wireless motility capsule and lactulose breath testing using standard protocols. Results We studied 65 patients with PD and various gastrointestinal symptoms. 35% exhibited gastroparesis by the wireless motility capsule study, 20% small bowel transit delay, while 8% had combined transit abnormalities, suggestive of overlapping gastric and small bowel dysmotility. Small bowel bacterial overgrowth was seen in 34% of cases. Symptoms of abdominal pain, regurgitation, bloating, nausea, vomiting, belching and weight loss could not distinguish between patients with or without gastroparesis, although bloating was significantly more prominent (p<0.001) overall and specifically more so in patients with slow small bowel transit (p<0.01). There was no relationship between delayed small bowel transit time and bacterial overgrowth (p=0.5); PD scores and duration were not correlated with either the transit findings or small bowel bacterial overgrowth. Conclusions Functional gastrointestinal symptoms in patients with PD may reflect gastroparesis, small bowel transit delay or both, suggesting motor and/or autonomic dysfunction, and may be associated with small bowel bacterial overgrowth. The wireless motility capsule and lactulose breath testing are non-invasive and useful in the assessment of these patients. ▸ Functional gastrointestinal symptoms are quite prevalent in patients with Parkinson's disease (PD) and their pathophysiology is complex and multifactorial. ▸ The wireless motility capsule (WMC) can routinely quantify gastric and small bowel transit times. ▸ The lactose breath test (LBT) is commonly used for the diagnosis of small intestinal bacterial overgrowth. ▸ Bloating and other functional gastrointestinal symptoms in patients with PD mostly reflect underlying gastroparesis, but small bowel transit delay and overlap syndromes occur. ▸ WMC and LBT are useful in the assessment of patients with PD with functional gastrointestinal symptoms. ▸ Symptom scores, Parkinson's disease scores and disease duration are not correlated with either the WMC or the LBT findings. ▸ The usage of WMC and LBT tests can transform the non-specific functional gastrointestinal symptoms into specific disorders, such as gastroparesis as well as small bowel transit delay and bacterial overgrowth, and may guide specific clinical management in patients with PD. Functional gastrointestinal (GI) symptoms are common in patients with Parkinson's disease (PD); their aetiology is multifactorial and their management challenging.1 Such symptoms may precede motor symptoms in PD and worsen as the disease progresses. Many recent studies have identified α-synuclein pathology in the gut that may serve as a possible biomarker of early PD.2 Several underlying abnormalities, such as dysmotility, visceral hypersensitivity, changes in gut microbiota and altered central and autonomic nervous system processing, may play a role.3 Assessment using radiological and endoscopic tools is important in ruling out structural abnormalities, but these tests are frequently negative or inconclusive. Small intestinal bacterial overgrowth (SIBO), defined as the presence of excessive bacteria in the small bowel, may cause non-specific symptoms, such as bloating, abdominal distension or discomfort, diarrhoea and weight loss.8 These symptoms most likely reflect both bacterial overgrowth-induced mucosal inflammation and the underlying cause, such as dysmotility and delayed small bowel transit.9 Recently, the role of gut microbiota in PD pathogenesis has received attention and some phenotypic correlations have also been shown.10 Lactulose breath testing (LBT) is a widely used method for the diagnosis of SIBO and, if positive, allows for antimicrobial therapy aiming at bacterial eradication and symptom relief. Used together, WMC and LBT are poised to guide optimal therapy for functional GI disorders in the general population as well as in special groups, such as in patients with PD. The aim of this retrospective cohort study was to assess the prevalence of gastroparesis, small bowel transit delay and bacterial overgrowth in patients with PD suffering from various functional GI symptoms and to highlight objective parameters that could help in the current management algorithm for such patients. This retrospective cohort study using prospectively collected data was approved by the Institutional Research Board of Stanford University and was conducted at the Neuro-gastroenterology and Motility Center of Silicon Valley Gastroenterology, in Mountain View, California, USA. The protocol was considered exempt from the need for individual informed consent from participating patients. Inclusion criteria: We included consecutive patients with PD who were all referred because of various functional GI symptoms and who agreed to undergo WMC and LBT. All patients had recurrent symptoms persisting for >6 months. All patients fulfilled the Rome IV criteria for functional dyspepsia, nausea and vomiting, abdominal bloating/distension or unspecified functional bowel disorder.11 ,12 Exclusion criteria: Patients aged <18 years, those with known GI pathology (ie, inflammatory bowel disease, stricture), other systemic illnesses affecting motility (ie, scleroderma, diabetes) and those who had previously undergone respective GI surgery were excluded. The study patients were part of a total cohort of 95 patients with PD evaluated at our centre during the study period for various GI symptoms, predominantly epigastric pain, regurgitation, nausea, vomiting, early satiety, bloating and weight loss (figure 1). Study participants had previously undergone upper endoscopy without revealing any structural explanation for their upper GI symptoms. Symptoms were recorded on questioning and formal quantitative questionnaire-based assessment. Neurological assessment of the patients was made using the previously validated modified Hoehn and Yahr scale (score 0–5);13 the duration of PD was recorded in years since the time of diagnosis. Variable regimens of PD therapies were used and not discontinued for the conduct of any of the tests performed. Such therapies included carbidopa-levodopa, carbidopa-levodopa-entacapone, pramipexol, ropinirol, rotigotine, rasagiline, trihexyphenidyl, selegiline, tolcapone, rivastigmine and amantadine in various doses and schedules (table 1). Prospectively collected clinical, transit and LBT data from these patients were then analysed. Of note, the study, albeit community-based (not hospital-bound or nursing home-bound) of patients attending a PD/Movement disorders institute and clinic, was on a referral population to a GI motility unit. Study flow diagram. Of the entire population of 95 patients with PD referred, 65 were studied with WMC and 64 with LBT. The remaining 30 who were excluded had similar clinical characteristics to the study cohort by questionnaire analysis. GET, gastric emptying time; LBT, lactose breath test; PD, Parkinson's disease; WMC, wireless motility capsule; SBTT, small bowel transit time. The WMC (Smartpill; Medtronic, Sunnyvale, California, USA) is an ambulatory, non-invasive diagnostic sensor that samples intraluminal pH, temperature and pressure as it moves through the GI tract.6 ,15 Patients first ingested a meal in order to initiate the postprandial motility pattern following an overnight fast. The meal consisted of a SmartBar (260 kcal, 2% fat, 2 g fibre), followed by 120 mL water. Immediately after the meal, patients swallowed the capsule with 50 mL water. They were then released and given the data receiver and a diary for recording bowel movements, food intake, sleep and GI symptoms. Physical restrictions included no strenuous activities such as sit-ups, abdominal crunches and prolonged aerobic activity (>15 min), which could affect pressure measurements. Additionally, patients refrained from the use of GI medications that could affect motility (ie, laxatives) or gastric pH (ie, proton pump inhibitors). Patients were asked to fast for 6 hours after capsule ingestion, after which they ingested a regular meal. This meal would allow for the evaluation of the fed response, which is the change in contractile pattern of the small bowel from a fasting to postprandial pattern. Patients were then instructed to continue their regular diet and routine and to return the data receiver and diary to our facility after 5 days. Downloaded data are analysed using the display software (Medtronic, Sunnyvale, California, USA). A 10 g lactulose load is orally administered to the patient, and exhaled breath gases are analysed at 15 min intervals. Elevated fasting levels of hydrogen (H2) and methane (CH4) have also been shown to be suggestive of SIBO; a positive test required an elevated breath hydrogen concentration within 90 min, two distinct peaks and an increase >20 ppm.16 We did not measure methane and we did not record symptoms during our breath testing procedure. Clinical information, including age, gender and GI symptoms, was collected in all patients. WMC and LBT were analysed under blinded conditions. Gastric emptying time (GET) longer than 5 hours was diagnostic of gastroparesis; while small bowel transit time (SBTT) longer than 6 hours defined small intestinal transit delay. For the lactulose testing, an increase in H2 of 20 parts per million within 90 min was diagnostic of SIBO.15 ,16 Statistical analysis was performed using Minitab Express software. When applicable, p values of <0.05 were considered statistically significant. Sixty-five patients with PD fulfilling the eligibility Rome IV criteria (see Methods section) were enrolled in the study. As shown in figure 1, these patients represented 68% of the total number of patients with PD evaluated at our centre because of various GI symptoms. Of the remaining 30 who were not studied, 24 declined testing for various reasons (ie, not interested, too ill, insurance non-authorisation, etc), while 6 patients could not swallow the WMC despite multiple attempts. Clinically, those 30 patients were not significantly different from those studied. Specifically, their mean age was 68 years (range 41–82), 59% were women, and their mean cumulative symptom score was 0.50±0.13 (SEM) (as compared to the cohort's mean score of 0.66±0.12 (SEM), p=0.08 (95% CI −0.36 to 0.03)). The mean age of the 65 patients in the cohort was 72 years (range 52–91 years), and 31 (47%) of them were women. The median body mass index of the cohort was 24.9 (95% CI 23.9 to 26.9). The median Hoehn and Yahr score was 3 (95% median CI 2.72 to 3.00); the median duration of their PD was 6.5 years (range 0.6–22). 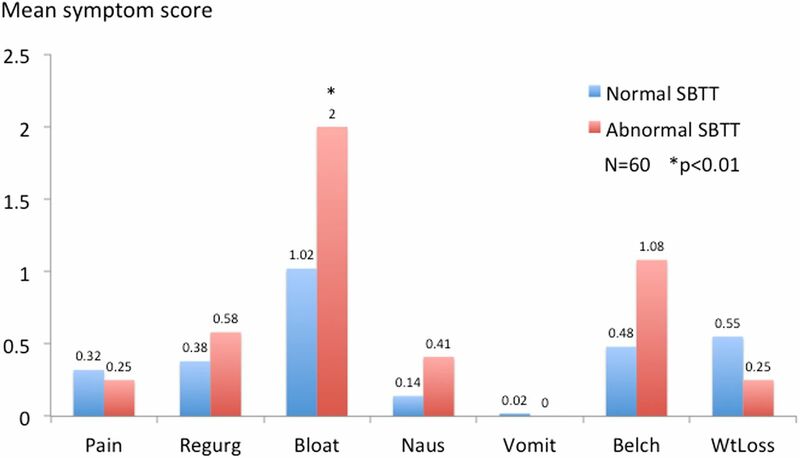 Figure 2 depicts the mean scores for the individual symptoms assessed by questionnaires; abdominal pain 0.42, regurgitation 0.45, bloating 1.21, nausea 0.28, vomiting 0.05, belching 0.57 and weight loss 0.53. As compared to all others, bloating was the most significant symptom (p<0.001). The per cent prevalence of each individual symptom in our cohort was: abdominal pain 26%; regurgitation 36%; bloating 61%; nausea 17%; vomiting 4%; belching 41%; and weight loss 27%. Mean symptom scores of the study cohort. Among all symptoms, bloating was the only symptom that was significantly more severe (p<0.001). 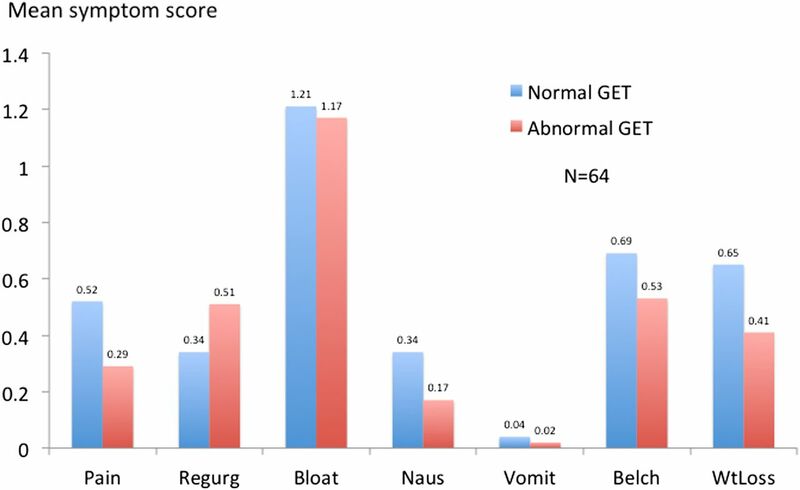 The various symptom scores in patients with normal or prolonged GET (gastroparesis) (n=64 because in one patient GET could not be computed) and in those with normal or delayed SBTT (n=60 because in 5 patients SBTT could not be computed) are shown in figures 3 and 4, respectively. In those analyses, the only significant difference seen was with bloating scores between patients with normal and delayed SBTT (p<0.001). In general, symptoms were not discriminatory and could not predict the underlying GI motility abnormality. There was no relationship between GET and the Hoehn and Yahr scores (Pearson correlation 0.065; p=0.60) (data not shown) or disease duration (Pearson correlation −0.03; p=0.78) (data not shown). Similarly, there was no relationship between SBTT and the Hoehn and Yahr scores (Pearson correlation 0.18; p=0.16) (data not shown) or disease duration (Pearson correlation 0.19; p=0.13) (data not shown). Mean symptom scores of patients with PD with normal and abnormal GET. There were no significant differences between the two groups, suggestive that gastroparetic patients may not be clinically distinguishable. GET, gastric emptying time; PD, Parkinson's disease. Mean symptom scores of patients with PD with normal and abnormal SBTT. Bloating was significantly more severe in those patients with delayed SBTT, as compared to those with normal small bowel transit (p<0.01). PD, Parkinson's disease; SBTT, small bowel transit time. 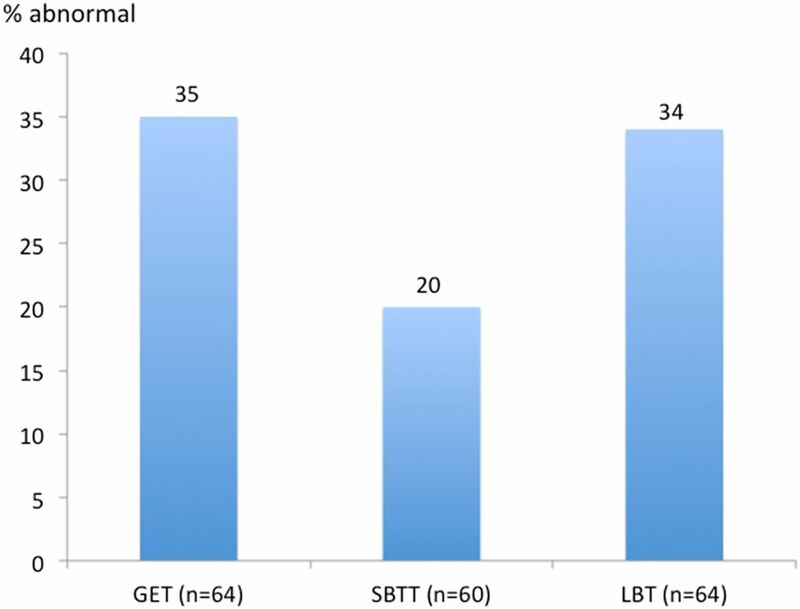 Figure 5 shows the percentages of abnormal GET, SBTT and LBT, respectively. All values were statistically significant (GET χ2 3.69, p<0.05, SBTT χ2 20.08, p<0.0001, LBT χ2 5.06, p<0.02). 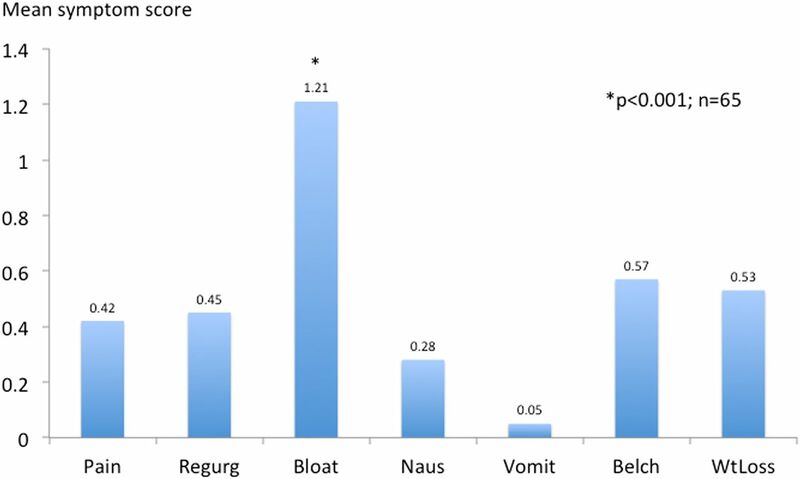 Thirty-five per cent exhibited gastroparesis by the WMC study, 20% small bowel transit delay, while 8% had combined transit abnormalities, suggestive of overlapping gastric and small bowel dysmotility (data not shown). There was no significant relationship between GET and SBTT (Pearson correlation 0.04; p=0.72). Thirty-four per cent of the 64 patients studied (one had a technically inadequate study) had positive LBT, suggestive of small bowel overgrowth. In the patients with prolonged GET, the mean GET was 12.6±1.5 hours; in those with prolonged SBTT, the mean was 10.4±1.4 hours. There was no relationship between LBT and SBTT (Pearson correlation 0.095; p=0.9) (data not shown). There was no relationship between LBT and the Hoehn and Yahr scores (Pearson correlation −0.005; p=0.96) (data not shown) or disease duration (Pearson correlation −0.13; p=0.27) (data not shown). Bar graphs highlighting the percentages of abnormal GET, SBTT and LBT in the study cohort. All values were statistically significant (GET χ2 3.69, p<0.05, SBTT χ2 20.08, p<0.0001, LBT χ2 5.06, p<0.02). GET, gastric emptying time LBT, lactose breath test; SBTT, small bowel transit time. The aim of our study was to determine any clinical utility in performing WMC and LBT in patients with PD suffering from various functional GI symptoms. Using these modern day clinical tools, we have demonstrated that a significant percentage of these patients (35%) have gastroparesis, 20% have delayed small bowel transit time and 8% have overlapping gastric and small bowel transit delay. Thirty-four per cent of such patients have small bowel bacterial overgrowth. Obviously, these results have therapeutic implications, since different targeted therapies can be applied, alone or in combination, for each patient. The pathophysiology of functional GI symptoms in PD is complex and difficult to decipher without the use of specialised tests like the ones used in this study. One mechanism, as shown here as well as in other studies, is prolonged gastric transit time (gastroparesis).17 ,18 Another is delayed small bowel transit which, based on our data, contributes significantly to the clinically distressing symptom of bloating. To the best of our knowledge, this has not been previously examined, but it could reflect deposition of α-synuclein or myenteric plexus neuronal loss. However, gastric and small bowel transit delays may also reflect adverse effects of the drugs that are almost universally used in PD, such as anticholinergics and dopaminergic agents, as it has been previously shown in patients with constipation.19 The coexistence of mixed sensory and motor symptoms, such as abdominal pain, nausea and bloating, suggest that more than one mechanism is involved.20 Nevertheless, previous studies have shown the occurrence of gastroparesis even in the early stages of PD;21 furthermore, others have reported on SIBO in PD.22 ,23 Our study found no correlation between small bowel dysmotility and SIBO and other potential factors could explain the high prevalence of SIBO in PD. In one study, the high prevalence of Helicobacter pylori in PD causing achlorhydria and, in turn, SIBO was discussed.24 HP was not systematically addressed in this study by either breath or stool antigen testing. In the subgroup of patients who underwent endoscopy at our centre (n=31), the prevalence of HP infection was quite low (6.5%) and the effect of HP treatment could not be assessed. On the basis of our findings, targeting therapy in patients with GI symptoms who are found to have specific abnormalities might be more therapeutically successful. In our study, for example, patients with PD with gastroparesis were treated with prokinetics, such as domperidone, or pyloric sphincter BoTox injections, those with small bowel transit delay were treated with prokinetics, while many patients with overlapping abnormalities were treated with combined modalities (data not shown).29 The colonic data on this cohort have also been previously published.30 Such therapies, however, were not formally assessed as part of our study given its retrospective nature and the lack of standardisation of the end points for each therapy. Prospective trials will be needed in order to examine the impact of such targeted approaches in patients with PD with functional GI symptoms further characterised by WMC and LBT, in comparison with those patients who remain undifferentiated and empirically treated. Given the multitude of motor and sensory abnormalities noted in our study, such trials will be challenging, since many patients may require multiple and repeated interventions. Furthermore, proper instruments to accurately assess the therapeutic response (or lack thereof) in the PD population will need to be developed. There are several strengths and weaknesses in our study. First, since our analysis was conducted in a community-based cohort, its findings could be applicable to the general population with PD and functional GI symptoms. There have been no previous studies in patients with PD exploring the role of WMC as a single modality to assess several regional transit times (ie, stomach, small bowel, colon); hence, the data from these analyses could serve as preliminary elements and a launching pad in our further understanding of the relationship between the disease and its gut manifestations. Second, the study attempted to exclude selection bias by first clinically assessing an entire PD cohort and then proving that the patients studied were similar to those who were not. However, a non-participation rate of 30% is not low and could be seen as a limitation. Third, the performance of WMC and LBT led in many patients to a specific diagnosis and therapy unavailable before that time (ie, BoTox injection of the pyloric sphincter, oral rifaximin). However, the retrospective nature of our study does not allow us to reflect on the impact and true benefit of the treatments applied, be they pharmacological or endoscopic. Fourth, inherent limitations of the WMC and LBT in assessing regional transit times (ie, due to unidentifiable pH landmarks) or false-positive results (ie, due to retrograde colonic bacterial contamination of the small bowel) could have challenged their validity. However, such scenarios were not of significant impact in our study. Fifth, the unified Parkinson’s disease rating scale (UPDRS), which is generally used to follow the longitudinal course of PD, was not used and could be limiting our study. Instead, the Hoehn and Yahr scale (a component of the UPDRS) was used to stage the disease at the time of our GI assessments reported herein. Finally, our study design did not allow us to detect any changes in the variables examined over time or in the absence of PD therapies. Given the clinical impact that drug discontinuation would have on the patients' neurological function and mobility, it would have been unethical to even transiently disrupt continuous therapy. Therefore, our data should be considered as reflecting previously optimised PD control using currently available neurological therapies and additional strategies would need to be implemented if we were to expect a favourable therapeutic impact on the gut manifestations. In conclusion, functional GI symptoms are prevalent in patients with PD and may reflect underlying gastroparesis, small bowel transit delay or both, and may be associated with small bowel bacterial overgrowth. Clinical symptoms are not discriminatory and the use of these non-invasive tests may be beneficial in further characterising and specifically treating such patients.
. Functional gastrointestinal disorders: history, pathophysiology, clinical features and Rome IV. Gastroenterology 2016;150:1262–79.
. Investigation of colonic and whole-gut transit with wireless motility capsule and radiopaque markers in constipation. Clin Gastroenterol Hepatol 2009;7:537–44.
. The utility of wireless motility capsule and lactulose breath testing in the evaluation of patients with chronic functional bloating. BMJ Open Gastroenterol 2016;3:e000110.
. Small intestinal bacterial overgrowth: a comprehensive review. Gastroenterol Hepatol (NY) 2007;3:112–22.
. Altered small bowel motility in irritable bowel syndrome is correlated with symptoms. Gastroenterology 1987;92:1885–93.
. Bowel disorders. Gastroenterology 2016;150:1393–407.
. Small intestinal bacterial overgrowth in Parkinson's disease. Parkinsonism Rel Disord 2014;20:535–40.
. Helicobacter pylori infection is associated with worse severity of Parkinson's disease. Parkinsonism Rel Disord 2015;21:221–5. Contributors AS and GI participated in collecting and interpreting the data. All authors participated in drafting the manuscript and revising it.